Greece remains a jurisdiction where medium and large businesses are owned and managed by Greek families who need advice on the structuring of the generational transfer of business. Furthermore, Greece attracts foreigners that relocate to Greece and require pre-immigration advice on the operation of the Greek forced heirship rules and the tax efficiency of existing ownership structures. In addition, Greece attracts investments in real estate, by non-resident private clients, who need advice on the structuring of the acquisition, ownership and disposal of such investments. Furthermore, owing to the beneficial tax regime of shipping companies operating under Law No. 27/1975, Greece attracts relevant activities. Lately, amendments have been introduced into the Greek tax legislation dealing with individuals' wealth, such as provisions relating to controlled foreign companies (CFC) rules. The new Income Tax Code (Law No. 4172/2013 (ITC)), effective from 1 January 2014, as recently amended, introduces a number of significant changes to the tax rules, including measures designated to combat tax avoidance and tax evasion. For instance, under the new ITC, any wealth increase deriving from an illegal, unjustified or unknown source or cause is considered as business profits subject to tax at 33 per cent. In addition, the new Tax Procedures Code (Law No. 4174/2013 (TPC)), as recently amended, which is a separate piece of legislation, explicitly introduces a 'general anti-avoidance provision', as a measure to combat tax avoidance and tax evasion. In this frame, under Article 66 of the TPC, the meaning of acts of tax avoidance is broadened and the meaning of concealment of income is clarified. Finally, in terms of ruling, from a tax perspective, wealth, income and succession planning, Greece may use an extensive double taxation treaty network (57 income tax treaties and five estate tax treaties). Individuals who are tax residents of Greece are subject to Greek income tax on their worldwide income (Greek and foreign income) while a foreign tax credit is provided on foreign income declared in accordance with the Organisation for Economic Co-operation and Development (OECD) guidelines for the avoidance of double taxation. Non-Greek tax residents are subject to Greek income tax only for their income sourced in Greece. The Greek ITC provides an indicative list of income considered as arising in Greece (Greek-sourced income). For income tax purposes, an individual is considered as a Greek tax resident, provided that he or she maintains in Greece his or her permanent or primary residence or habitual abode or the centre of his or her vital interests (i.e., personal, economic and social bonds) or he or she is a consular or diplomatic employee or public officer of similar status or a civil servant of Greek nationality and serving abroad. Also, an individual residing in Greece continuously for a period of more than 183 days is considered as a Greek tax resident. This is not applicable in cases of an individual residing in Greece exclusively for tourism, medical, therapeutic or similar private purposes, if his or her residence does not exceed a period of 365 days, including short-term stays abroad. The above provision may not be applicable if a double taxation treaty (DTT) (ratified by law) exists, in which case DTT provides a different way of taxation from the tax residence of the other country – party of the DTT. It is mentioned that DTT, by its integration into Greek (domestic) law, has automatically acquired an increased legislative power over the domestic legislation, according to Article 28 of the Greek Constitution. Greece has entered into DTTs with the following countries, providing beneficial income tax provisions compared to internal income tax legislation: Albania, Armenia, Austria, Azerbaijan, Belgium, Bosnia-Herzegovina, Bulgaria, Canada, China, Croatia, Cyprus, the Czech Republic, Denmark, Egypt, Estonia, Finland, France, Georgia, Germany, Hungary, Iceland, India, Ireland, Israel, Italy, Korea, Kuwait, Latvia, Lithuania, Luxembourg, Malta, Mexico, Moldova, Morocco, Netherlands, Norway, Poland, Portugal, Qatar, Romania, Russia, San Marino, Saudi Arabia, Serbia, Slovakia, Slovenia, South Africa, Spain, Sweden, Switzerland, Tunisia, Turkey, Ukraine, United Arab Emirates, United Kingdom, United States and Uzbekistan. Different tax rates apply to the above categories for individuals. The applicable tax rates are either progressive or tax exhaustive (one-off tax). The above-mentioned types of income are taxed as follows. Income derived from employment or pensions is considered to be the gross income from salaried work and pensions, and includes all types of income, in cash or kind acquired, in the context of any current, past or future employment relationship. In addition, the ITC explicitly provides that the board of directors' fees are categorised as employment income for tax purposes. the provision of company mobile phone connections to employees, managers and board members to the extent that it goes beyond the cost of their tariff plan, provided that the excess above the tariff plan is used for personal reasons and not for reasons associated with the employer's business activities. Moreover, according to the ITC, any increase of wealth for an individual deriving from an illegal, unjustified or unknown source or cause is considered as income derived from business activities and is further subject to tax at 33 per cent. Capital income is a distinct category of income and includes the income, in cash or in kind, from dividends, interests, royalties and immovable property. Income from dividends is defined as the income from shares, founders' shares, or other rights of participation in profits that are not debts, as well as income from other corporate rights, including interim dividends and actuarial reserves, profits from partnerships and any other distributed amount. Income from interest is defined as the income on any kind of claims, either secured by mortgage or not, whether providing a right to participate in profits of the debtor or not. Specifically, this includes income from deposits, government securities, bonds (with or without security) and from every kind of loan agreement, including premiums, repurchase agreements or reverse repurchase agreements and rewards derived from shares, partnerships, bonds or securities. There is a tax exemption regarding the income by the interest of bond loans and treasury bills of the Greek state, received by individuals, as well as to the interest arising from bonds issued by the European Financial Stability Facility in application of the programme for the restructuring of the Greek debt. Income from royalties is defined as the income gained in exchange for the use or the right to use any kind of intellectual property rights. Income from real estate property is defined as the income (in cash or in kind) derived from leasing (rental), self-use or the free concession of the use of land or real estate property. The income received in kind is calculated at the market value. In addition, the income for self-use or the free concession of use is equal to 3 per cent of the objective value of the property. A tax exemption is applied to the aforementioned presumptive income in the case of the free concession of the use of the real estate property – which shall not exceed 200 square metres – to a relative in the ascending or the descending line, who will use it as his or her main residence. royalties payments are subject to a withholding tax at the rate of 20 per cent, exhausting any further tax liability for individuals (final tax). As of 1 January 2017, income from the short-term lease of real estate in the context of the sharing economy is taxed in accordance with the provisions of Article 39A of the ITC. Specifically, rental income from the short-term lease of immovable property in the sharing economy is considered as taxable income deriving from immovable property, provided the immovable property is furnished when rented, without the provision of any additional service other than the provision of bed linen, and is taxed pursuant to the corresponding applicable tax scale (15 per cent to 45 per cent). If any additional services are provided, the income is considered as business income and taxed according to the corresponding applicable tax scale (22 per cent to 45 per cent). Short-term lease of immovable property in the context of the sharing economy (Article 39A of the ITC) is exempt from value added tax (VAT), provided that, during the lease, the lessor does not provide additional services to guests similar to those offered in hotels, such as cleaning services, waste collection, changing linen and other customer care services. The supply of bed linen is not considered an additional service and therefore has no effect on the VAT exemption. Also, other utilities such as electricity, water and internet connection, which are charged to the host and subsequently passed on to the guest, are included in the value of the rental price and therefore are not considered additional services and do not affect the VAT exemption. Any surplus that arises from the transfer of capital (i.e., real estate property, securities, listed shares, sovereign bonds, interest-bearing bills, company bills or derivative financial products as described in the ITC) is considered income from capital gains and is subject to tax at a rate of 15 per cent. The taxable surplus is the difference between the purchase (acquisition) price and the transfer (selling) price. An exemption from the said tax is applied in special cases. For example, any capital gains derived from the transfer of securities by individuals could be exempted from capital gains tax if said individuals are tax residents of another state with which a DTT has been signed, and provided that all the necessary documentation is submitted to the relevant tax administration authority, evidencing the residence of the aforementioned individuals to these states. Taxation on capital gains from the transfer of real estate property is postponed until 31 December 2018. The ITC provides an alternative method for calculating the minimum tax obligation of individuals according to certain objective criteria. If, after application of those objective criteria, the deemed income of the taxpayer is higher than the declared income, he or she will be taxed according to his or her deemed income. Purchases of cars, motorcycles, boats, aeroplanes and other goods that cost above €10,000, the establishment or the participation in the capital increase of a company under the form of an unlimited or limited liability partnership or corporation or limited liability company or private corporation or society of civil law or joint venture or purchase of company parts or securities, as well as payments to insurance investment contracts, to the extent that they constitute investment product, are taken into account in the calculation of the taxpayer's annual deemed income. The taxpayer can, under certain conditions, cover the difference between actually declared income and income that is deemed after the application of the above rules, by showing that the amount in excess of the declared income is justified by savings made from income taxed in previous years. Deemed income provisions are not applicable in the case of a foreign tax resident who does not earn income from Greek sources. CFC rules have recently been introduced in the ITC, with the aim of dealing with the tax avoidance of Greek companies or individuals, through shifting revenues to subsidiaries in low-tax jurisdictions. it is not a company with a principal category of shares traded in an organised market. The above shall not apply to cases where the legal person or legal entity is a tax resident of a Member State of the European Union or a tax resident of a country that is a party to the EEA Agreement, unless the legal person or legal entity's establishment or economic activities are an artificial arrangement devised for the purpose of avoiding the corresponding tax. This income is taxed at the rates applicable to income derived from business activities, as they are provided above. As a result of the economic crisis, a special solidarity tax contribution is imposed on individuals' total income (both declared and deemed income) of any source that exceeds €12,000 on an annual basis. From 1 January 2020 onwards, a special solidarity tax contribution will be imposed on individuals' total income of any source that exceeds €30,000 on an annual basis. In addition, as of 27 May 2016, salaries and wages are subject to withholding tax against solidarity tax contributions in accordance with the above rates. for aircrafts, helicopters, swimming pools and yachts more than 5 metres long, a tax rate of 13 per cent is applied. The rate of the real estate transfer tax is 3 per cent calculated on the value of the real estate property. For tax purposes, a system has been established for the objective calculation of the value (i.e., based on a system of minimum values). According to this system, if contracting parties declare a price lower than the objective price, the taxes are based on the objective price (higher price). Lately, the actual sale prices of real estate in Greece have been significantly reduced and have been much lower than the objective values. As a result, the tax paid on the objective values provided by Greek law is higher than the tax that would be calculated on the actual sale price according to the contract. Annual real estate tax (ENFIA) is imposed on real estate property rights including main and supplementary tax (for real estate over €250,000) and applies to real estate located in Greece that is owned by individuals and entities. ENFIA is payable on an annual basis. The tax payable depends on a number of factors. A special tax applies on the value of real estate situated in Greece and owned by a company that has its registered seat at a non-cooperative state, as provided under Article 65 of ITC, at a tax rate of 15 per cent. However, if the company discloses all of its shareholders or ultimate beneficiaries (individuals) who hold a tax identification number in Greece, it is exempt from the special tax. Many other exemptions are also provided. According to international private law, Regulation No. 650/2012 of the European Parliament and of the Council of 4 July 2012 'on jurisdiction, applicable law, recognition and enforcement of decisions and acceptance and enforcement of authentic instruments in matters of succession and on the creation of a European Certificate of Succession', with effect from 17 August 2015, shall apply. The Regulation applies to all civil aspects of the succession to the estates of deceased people. It does not apply to revenue (for example, tax matters), customs or administrative matters. Areas of civil law other than succession, such as matrimonial property regimes, gifts and pension plans are not covered by the regulation. Regarding the general jurisdiction, the courts of the EU country in which the deceased had his or her habitual residence at the time of death shall have jurisdiction to rule on the succession as a whole. As a rule, the law applicable to succession is the law of the country in which the deceased had his or her habitual residence at the time of death. It can be the law of either an EU or non-EU country. However, before his or her death, a person can instead choose that the applicable law should be the law of his or her country of nationality. For example, a person of multiple nationalities (including Greek) may choose that the applicable law shall be the Greek law. A declaration of this shall be made in the form of a disposition of property upon death (i.e., a will). The applicable law will govern, for example, the determination of the beneficiaries and their respective shares, the capacity to inherit, the powers of the heirs, the executors of the wills and the administrators of the estate, the liability for the debts under the succession and the sharing out of the estate. The application of a single law by a single authority to an international succession avoids parallel proceedings, with possibly conflicting judicial decisions. It also ensures that decisions given in an EU country are recognised throughout the EU without need for any special procedure. Decisions enforceable in the EU country where they have been given are enforceable in another EU country when, on the application of an interested party, they have been declared enforceable there by the local court. The aforementioned regulation also introduces a European Certificate of Succession (ECS) to be used by heirs, legatees having direct rights in the succession and executors of wills or administrators of the estate to invoke their status or exercise their rights or powers in another EU country. Once issued, the ECS will be recognised in all EU countries without any special procedure being required. In contrast with national certificates of succession, which have different effects depending on the EU country of issue, the ECS will have the same effects, set out in the Regulation, in all EU countries. Greek succession law provides for forced heirship rules. The rules on forced heirship protect the closest relatives of the decedent, who may not disinherit them. Forced heirs are always entitled to a certain percentage of the estate (legitimate portion of the estate). Forced heirs are the descendants of the deceased (children), the surviving spouse and the parents of the deceased. According to Greek inheritance law, forced heirs are entitled to half of the portion they are entitled to in the case of intestacy. Under forced heirship rules, any disposal by will of the decedent's estate to the prejudice of the forced heirs is void. Moreover, if the testator donates his or her estate and as a consequence the estate at death is not sufficient to cover the legitimate portions of estate for the forced heirs, then said donation may be cancelled. According to Article 1 of Law No. 2961/2001 (the Code on taxation of inheritance, gifts inter vivos and lottery gains), tax is imposed to any asset acquired by inheritance, gift inter vivos and winnings in lotteries, whether acquired by an individual or a corporate entity. The legislator provides for a list of assets that are subject to inheritance tax. These are property of any kind situated in Greece that belongs to Greek citizens or foreigners, and movable property situated abroad that belongs to a Greek resident or (under conditions) to a foreigner residing in Greece. Movable property that is located abroad and belongs to a Greek citizen who was established outside Greece for at least 10 consecutive years is exempt from Greek inheritance tax. any movable property of a foreign national situated abroad that is being gifted or donated to a Greek or foreign citizen who resides in Greece. brothers-in-law, sisters-in-law, fathers-in-law and mothers-in-law. Category C includes the remaining relatives and aliens. As an exception, by virtue of Law No. 3842/2010, monetary gifts inter vivos are taxed at a rate of 10 per cent when the gift is given to a relative of category A, 20 per cent for category B and 40 per cent for category C.
Individuals who are subject to Greek inheritance tax on their worldwide assets can benefit from the Greece inheritance tax treaties. Greece has entered into tax treaties for the avoidance of double taxation in inheritance and estate tax with Germany, Italy, Spain and the United States to prevent double taxation. 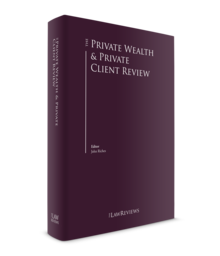 Thus, individuals who are subject to Greek inheritance tax on their worldwide assets can benefit from the Greek inheritance and estate tax treaties. Trusts and foundations are commonly used vehicles for private wealth structuring and planning. Recently, Circular Pol. No. 1114/2017 was issued by the Independent Authority of Public Revenue, providing for interpretative general guidelines with respect to the tax treatment both of the foreign trusts and foundations and their distributed or undistributed income to Greek tax residents within the framework of Greek income and gift and inheritance taxation. Specifically, pursuant to Circular Pol. No. 1114/2017, the tax treatment depends on the time period within which the taxable events take place as follows. As of 1 January 2014, the ITC recognises trusts and foundations as taxable legal entities for corporate income tax purposes. On individuals' taxation level, any distribution of profits, acquired by the settlor under his or her capacity as beneficiary of the foreign trust or foundation, falls within the definition of dividends, being that considered as taxable income, and is subject to Greek income dividend tax of 10 per cent, with effect for payments performed up to the tax year 2016 and 15 per cent, for the tax year 2017 onwards (plus solidarity tax contribution). In case the settlor or founder and the beneficiary of the trust or foundation is not the same person, the transfer of the trust's assets to the beneficiary is treated as a gift or inheritance for tax purposes and is taxed according to the gift or inheritance tax scale that is applicable based on the relationship between the settlor or founder and the recipient of the assets. Undistributed income that arises in the trust or foundation could be treated pursuant to the provisions of CFC rules referred to above, provided that all the conditions are cumulatively met. In the case of the trust or foundation's dissolution and liquidation, the distributed amounts that exceed the initial capital transferred to the trust or foundation are considered as dividends and are subject to Greek income dividend tax of 10 per cent, with effect for payments performed up to the tax year 2016, and 15 per cent, for the tax year 2017 onwards (plus solidarity tax contribution). There is no taxable event to the extent the distributed amounts do not exceed the initial capital since they are considered as capital repayment. Finally, the transfer of assets into the trust or foundation upon its settlement is not considered a taxable event. Greek Law No. 2238/1994, which was applicable on income taxation up to 31 December 2013, recognised only foundations as taxable legal entities for corporate income tax purposes. On individuals' taxation level, any distribution of profits, acquired by the settlor under his or her capacity as beneficiary of a foreign trust, is subject to income tax at the level of the settlor of the trust depending on the source of income (e.g., interest, dividends, capital gains), while, as per the distribution of profits from a foundation, acquired by the founder under his or her capacity as beneficiary of the foreign foundation, is subject to income tax according to the tax scale applicable on freelancers pursuant to Greek Law No. 2238/1994. If the settlor or founder and the beneficiary of the trust or foundation is not the same person, the transfer of the trust or foundation's assets to the beneficiaries is treated as a gift or inheritance for tax purposes and is taxed according to the gift or inheritance tax scale that is applicable based on the relationship between the settler of the trust or foundation and the recipient of the assets. The trust's dissolution and liquidation is not considered a taxable event, while, in case of the foundation's dissolution and liquidation, the distributed amounts that exceed the initial capital transferred to the foundation are subject to income tax according to the tax scale applicable on freelancers pursuant to Greek Law No. 2238/1994. There is no taxable event to the extent the distributed amounts do not exceed the initial capital since they are considered as capital repayment. Because of the beneficial tax regime of shipping companies operating under Law No. 27/1975, Greece attracts Greek or foreign ship-owning companies with vessels flying a Greek flag and foreign ship-owning companies with vessels flying a foreign flag, if their management is exercised by Greek companies or foreign companies established in Greece (operating under a special regime of offshore companies), which are subject to tonnage tax. The Greek tonnage tax regime applies to vessels of categories 'A' and 'B'. Category 'A' vessels includes cargo vessels, tankers, steel hull vessels for dry or liquid cargo that ply to or between foreign ports, passenger vessels, drilling platforms, etc., while category 'B' vessels include small boats and any other motor vessels not listed under category 'A'. The gross tonnage is calculated by multiplying coefficient rates by each scale of gross registered tonnage. This taxable tonnage is then multiplied by an age-corrected rate. A credit for the tonnage tax paid abroad is provided. The shipowner is liable to pay the ship's tonnage tax, whether an individual or a legal entity, who is the registered owner of the relevant ship on the first day of each calendar year. The person managing the ship and collecting the hire as well as the manager's representative, subject to the latter having accepted the relevant appointment in writing, are also jointly and severally liable to pay the ship's tonnage tax. Various exemptions and reductions of the tonnage tax apply, such as vessels built in shipyards in Greece, under a Greek flag, are exempt from tax for the first six years. Also, a 50 per cent reduction for vessels operating regular routes between Greek and foreign ports or solely between foreign ports. The payment of the tonnage tax exhausts all income tax liability of the shipowner with respect to income derived from the ship's operation; the exhaustion of tax liability also applies to the shareholders or partners of a (Greek or foreign) shipping company. It also covers all capital gains arising out of the sale of the vessel, realised at the level of either the shipowner, shipping company or their shareholders. If a company that owns a Greek-flagged ship also has commercial activities other than the operation of the ship, exemption from income tax applies to the net profits that correspond pro rata to the gross income the owner derives from ships, subject to the tonnage tax regime. In addition, the shareholders of the above-mentioned companies are exempt from any tax, duty, contribution or withholding, up to natural person, for the income acquired from dividends or distribution of net profits, whether such profits are acquired directly or through holding companies. Exemption from any taxation of the transfer of shares or parts of Greek or foreign shipowner companies, under Greek or foreign flags, regardless of the reason that the transfer applies. On the contrary, a 10 per cent withholding tax is applicable on dividend distributions, exhausting any further tax liability, to Greek tax residents by offices that are engaged in activities such as chartering, insurance, brokerage, etc, other than the management and exploitation of Greek or foreign-flagged ships. According to Article 29 of Law No. 27/1975, exemption from inheritance tax applies with respect to transfers of vessels, stocks or shares of Greek or foreign companies that own vessels flying a Greek or foreign flag with gross tonnage of over 1,500 and of stocks or shares of holding companies that hold stocks or shares of shipping companies, whether directly or through holding companies. Finally, an annual contribution, at a regressive tax scale of 5 to 3 per cent, referring to the years 2012–15, and at a regressive tax scale of 7 to 5 per cent, referring to the years 2016–19, is imposed on offices or branches of foreign enterprises that have been established in Greece by virtue of Article 25 of Law No. 27/1975 and that are engaged in the chartering, insurance, average (damage) settlements, purchase, chartering or shipbuilding brokerage, or chartering of insurance of ships under the Greek or foreign flag whose capacity exceeds 500 gross registered tons, as well as the representation of shipowner companies or undertakings, whose object is identical to the above-mentioned activities. Greek and foreign companies that have established an office or branch under Law No. 27/1975 and are engaged in the management of vessels flying a Greek or foreign flag, as well as in other activities approved by their licence of operation, are exempt from the above-mentioned annual contribution. In Greece, a general anti-avoidance tax rule has been introduced for the first time under Article 38 of the TPC, according to which the tax administration may disregard any artificial arrangement or series of arrangements, performed either by individuals or legal entities, that aim to evade taxation and lead to a tax advantage. An arrangement is considered artificial if it lacks commercial or economic substance. To determine whether an arrangement is artificial, various characteristics are examined. For the purposes of this provision, the goal of an arrangement is to avoid taxation in the event that, regardless of the subjective intention of the taxpayer, it is contrary to the object spirit and purpose of the tax provisions that would apply in the other cases. In order to determine the tax advantage, the amount of tax due taking into consideration such arrangement is compared to the tax payable by the taxpayer under the same conditions in the absence of such arrangement. Finally, by virtue of specific tax provisions, transactions (e.g., expenses) between domestic entities and entities of non-cooperative states or states with beneficial tax regimes (e.g., offshore entities) are not recognised for income tax purposes. At an EU level, the Economic and Financial Affairs Council adopted Council Directive 2018/822/EU amending Directive 2011/16/EU as regards mandatory information on automatic exchange of reportable cross-border arrangements. The main purpose of this framework, known as DAC6, is to provide a mechanism that will enhance and increase tax transparency throughout the EU as regards tax-aggressive cross-border arrangements, which effectively result in tax avoidance. Each Member State must implement DAC6 into their domestic laws and regulations by 31 December 2019 and be in position to apply the new mandatory disclosure rules by 1 July 2020.
simplified limitation on benefits (LOB) provisions. The MLI does not include a detailed LOB provision given the substantial customisation required by Member States. Instead, the MLI allows parties who prefer to address treaty abuse by adopting a detailed LOB provision to opt out of the PPT and agree to 'endeavour to reach a bilateral agreement that satisfies the minimum standard'. In addition, the MLI allows parties who prefer a detailed LOB provision to express their intention to incorporate the PPT as an interim measure while the detailed LOB provision is bilaterally negotiated. In particular, for a special purpose vehicle, fund or holding company, the above limitation could arise if a significant percentage of the ultimate beneficial owner does not qualify for the tax relief that the legal entity seems to qualify. Greece seems to opt for the PPT rule. Therefore, even if the other jurisdiction chooses the LOB provisions, the PPT rule will apply if the source country (place of payment) is Greece. The MLI will apply after being ratified and incorporated in the domestic legal framework of each jurisdiction. Currently, the Greek tax administration is not yet familiar with MLI framework, as it is not yet applicable in everyday practice and has not been implemented. Where the taxpayer conceals from the tax authorities taxable income from any source or assets, in particular by failing to submit tax returns, by submitting inaccurate tax returns, by recording (totally or partially) fictitious costs in his or her accounting records, or by using such fictitious costs so as not to disclose or to disclose reduced taxable income with the intention of avoiding paying income tax, property tax or special property tax. Where the taxpayer fails to make payment, makes incorrect payment, offsets or incorrectly deducts taxes or misleads the tax authorities by presenting false facts as real or by concealing real facts by which he or she fails to make payment, makes incorrect payment or offsets or incorrectly deducts taxes or incorrectly receives a tax refund, or makes a tax withholding with the intention of avoiding paying VAT, turnover tax, insurance premium tax, withholding tax and contributions. Where the taxpayer fails to make payment, or makes incorrect payment, of the special vessels tax, with the intention of avoiding paying such tax. In addition, in the context of mutual administrative assistance and cooperation in tax matters on an international and EU basis (OECD, EU) for the automatic exchange of information, Greece has adopted the global standard for the automatic exchange of information of financial accounts (the Common Reporting Standard (CRS)). By virtue of Law No. 4378/2016 (Government Gazette A 55/106), amending Law No. 4170/2013, Greece implemented Council Directive 2014/107/EU 'amending Directive 2011/16/EU as regards mandatory automatic exchange of information in the field of taxation', adopting the use of CRS at European level. By virtue of Law No. 4428/2016 (Government Gazette A 190/2016), Greece ratified its participation in the Multilateral Competent Authority Agreement on the automatic exchange of financial account information. According to the new provisions, financial institutions and tax residents in Greece must adopt specified due diligence procedures for the purpose of identifying bank accounts of individuals and legal entities and report their findings annually to the Ministry of Finance. Wealth and succession planning for high net worth individuals is in demand in Greece. Greece has entered into many DTTs. Trusts are now recognised as taxable legal entities for corporate income tax purposes and are commonly used as a vehicle for wealth and succession planning purposes. It is also important to note that shipping companies operating under Law No. 27/1975 are attractive to wealthy individual for use as vehicles for Greek tax purposes because they fall under a beneficial tax regime. On the other hand, new tax provisions have been introduced, such as the CFC rules and other 'tax evasion' or 'artificial arrangement' provisions, with the aim of addressing tax evasion and preventing techniques that lead to a tax advantage. In line with the aim of these provisions, Greek tax authorities have been adopting a stricter attitude and policy towards any kind of tax planning. 1 Aspasia Malliou is a partner and Maria Kilatou is an associate of the tax law department at PotamitisVekris. This article was originally written by Aspasia Malliou and Eleni Siabi (a former associate of PotamitisVekris). In addition, it has been reviewed by Alexios Papastavrou, Kelly Papadaki and Anastasia Platipodi. Alexios Papastavrou is a partner and Kelly Papadaki and Anastasia Platipodi are associates of the family and inheritance law department at PotamitisVekris.